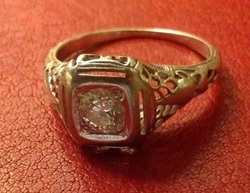 My engagement ring once belonged to my husband's grandmother. She gave it to my husband with her blessings not long before she died. It's from the 1920s, white gold. The stone is round in a square setting, which is a bit like I am :-). My husband proposed after returning from his college reunion and a trip home for the ring. He asked me to marry him late at night after I'd picked him up from the airport. I thought it was important that we both propose, so we headed to the mountains that fall weekend and proposed again to each other in the crisp air outside in the moonlight. I remember looking constantly at the new ring on my hand that weekend taking in all its beauty and meaning. Now I hardly notice it, but I still love it and love my husband for giving me an heirloom, a unique ring that suits me so well.